(Oct 25. 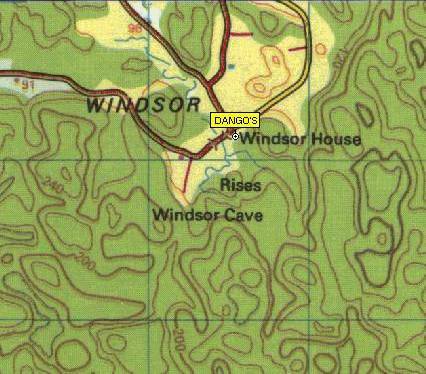 2011) - Current agreements with the WWF require all visitors to Windsor Cave to log in with the Cave Warden, Franklyn "Dango" Taylor, before entering the cave, in order to keep track of traffic. Contact with Dango beforehand is not easy (he's a rastafarian, and last we heard he still doesn't have a cell-phone), but he can often be found at a small shop at the start of the trail to the main entrance (see map). The cave is one of the most important in Jamaica, biologically, and is not well-suited to tourism. However, there is a long history of casual tourist visitation, and this can continue as long as appropriate etiquette is followed. Specifically, visitors should not touch formations (they're much more fragile than they look, and easily broken), not shine lights on the ceilings of the chambers where bats are roosting, and try to stay on the beaten path (to limit soil compaction, which destroys the habitat for various trog inverts). Physically, Windsor Cave is large and complex. Currently, few tourist visits extend beyond "Royal Flat", several hundred metres into the cave. To the south is the first drop (a 15 metre pitch that requires gear and knowledge of vertical rope techniques), then a second drop into the lower streamway, or one can go much further south to finally come out at Bamboo Bottom. The entire part of the cave past the first drop floods to the ceiling during the rainy season, and can do so quickly. The JCO strongly recommends that visitors do not venture into this part of the system between the months of April and December. Windsor is located at the start of the Troy - Windsor trail, on the northern edge of the Cockpit Country. Hiking tours on the trail can be arranged through the JCO. Accommodation is available at the nearby "Patrick's Cabin" (managed by Dango), or at the Last Resort, owned and operated by Ivor Conolley. The Windsor Great House also offers accommodations, and other services, and can be contacted via their website. Windsor is reached by travelling the road from Falmouth, Trelawny, to Martha Brae, and then crossing the bridge to the east and turning right to follow the valley south into the hills. This takes you along the side of the Martha Brae River (known for the bamboo rafting), and then through the small farming communities of Perth Town and Reserve, then through Sherwood Content, Coxheath, and finally to Windsor. Further information can be found on the JCO fieldnotes page for Windsor Cave.